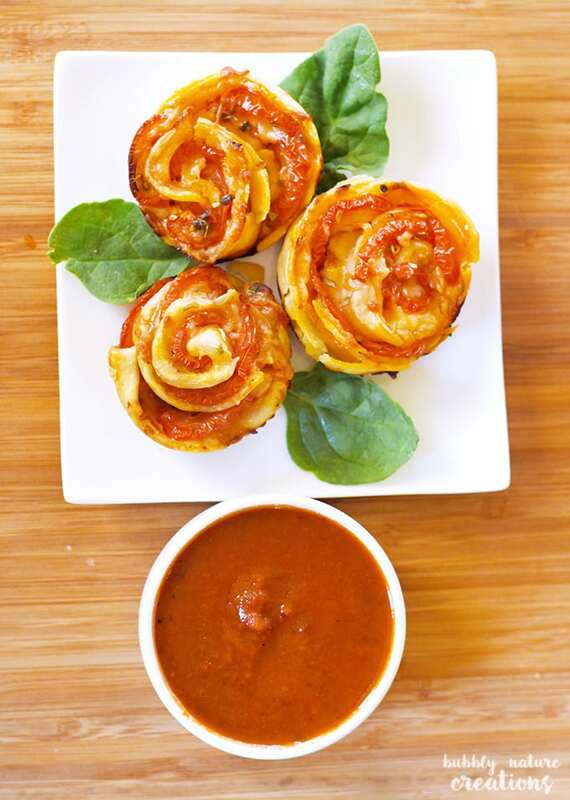 Pizza Roses have everything you love about pizza rolled up into a pretty little rose! This Pizza Roses recipe makes such a cute hand held pizza appetizer for any party. 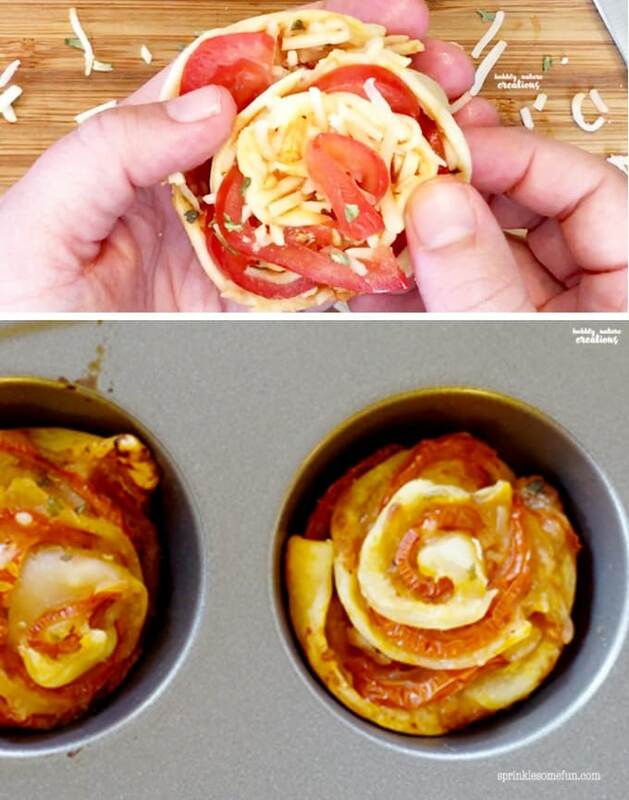 This pizza roses recipe couldn’t be easier to make. 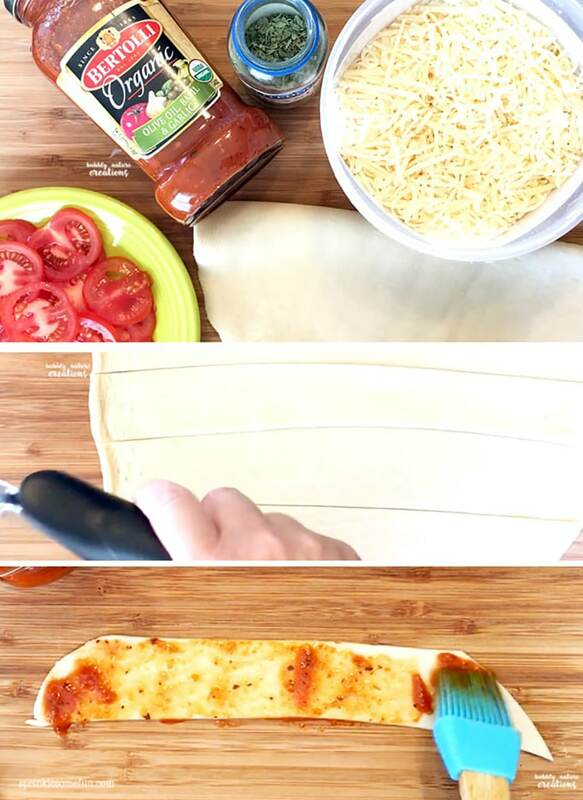 Using just a few ingredients you can make the cutest pizza creation ever! The holidays are coming up and so that means lots of pot lucks and parties in my future. This year I’m bringing easy Pizza Roses and I can’t wait until everyone tries them. 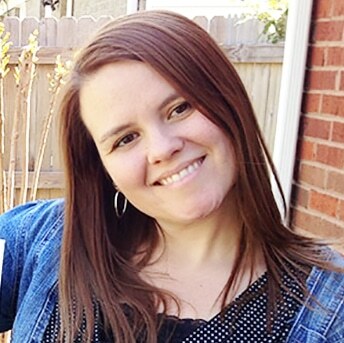 I tested these amazing pizza appetizers out on my family and they loved them! 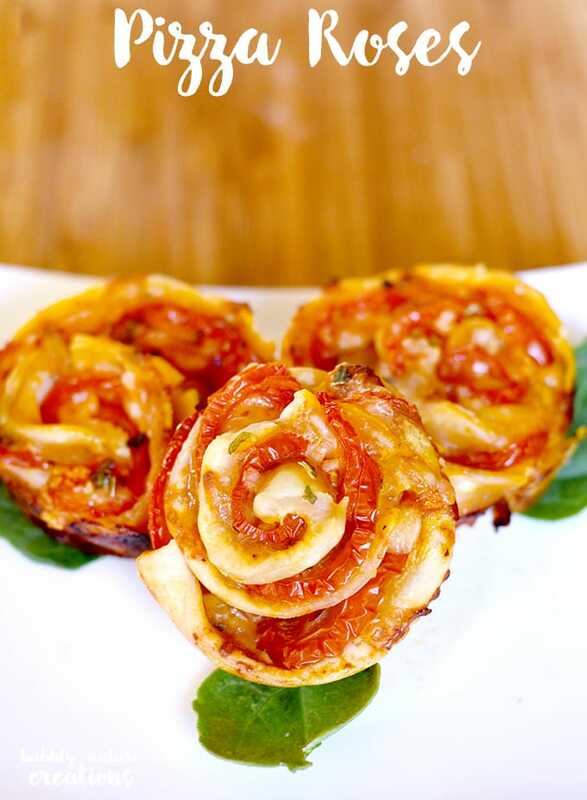 Pizza Roses make such a tasty and easy appetizer for special occasions or anytime you need a pizza fix. I like to use fresh ingredients in these like fresh tomatoes and cheese. 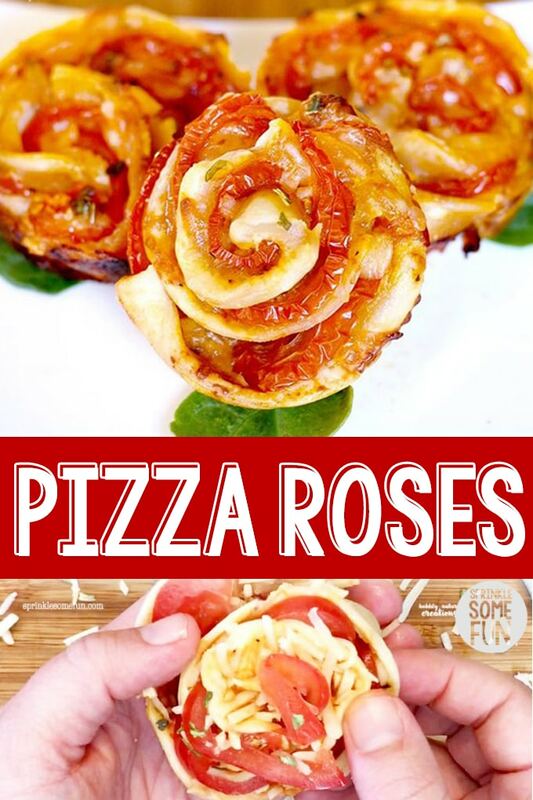 These pizza roses are as easy as pie because they are pie! I used pie dough to make them, but you can use any dough you like. I think the pie dough turns out the best pizza roses because they don’t puff out too big. Alternatively, you can use canned pizza dough with these or make your own dough! Tomatoes make a great filling for pizza roses because they are a bright red color like a rose. I used a smaller Roma tomato for these and sliced it really thinly. You can also use pepperonis in place of the tomatoes with similar results, although, I like the tomatoes the best. Alfredo Sauce. Instead of pizza sauce or spaghetti sauce try Alfredo sauce! This would be a favorite in my family for sure. Pepperoni Slices. As mentioned before, pepperoni would be great in place of the tomato slices. They are still a reddish color and would look good in the pizza roses. BBQ & Cheddar Cheese. Any cheese will work and I think cheddar cheese would be especially tasty. I love the pizzas with barbecue sauce and cheddar cheese. This could work in a pizza rose, but I’d keep the tomatoes and just put a few red onion slices in it. I’m not sure about adding the shredded meat to this, but if you use a thin layer it should still roll up easily. Hawaiian Style. Use Canadian bacon instead of the tomatoes and use a little crushed pineapple mixed with the sauce. Use a thin layer of sauce. 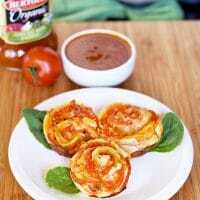 A little sauce goes a long way with these pizza roses and adding too much will make the pizza soggy. Just add a thin layer for the best results. Fan the rose out as you roll. The way that you get these to look like a rose is to make sure that the bottom is pressed in more than the top. As you are rolling keep fanning the top out while pushing in the bottom. Use a pizza cutter to cut out the dough. 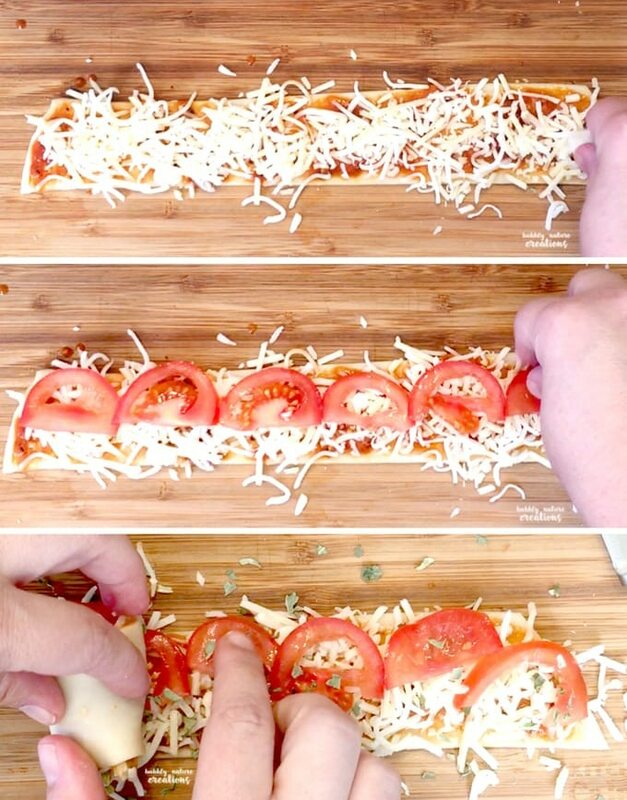 Using a pizza cutter will ensure a straight line and consistent size for the pizza roses. Use fresh spinach or fresh basil leaves to garnish. Fresh spinach or basil leaves make a cute addition to the pizza roses because they look like leaves. I especially love the fresh basil option because it really adds a lot of flavor to the appetizer as well. Bake in a muffin pan. The muffin pan is the best method for baking these because you can place them neatly into the cups and they won’t lose their shape. Once the roses have cooked through they should hold together on their own. 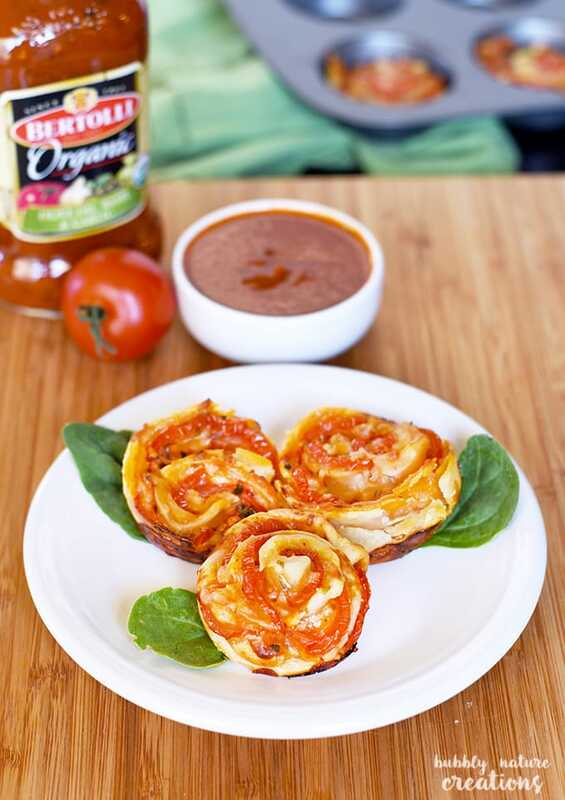 Try Bertolli® Pasta Sauce as a pizza dipping sauce on the side for these. Ranch Sauce. I don’t remember the first time I had ranch sauce with pizza, but I am pretty sure it’s been all my life. They just go together perfectly. Garlic Butter. Just melt a butter stick with a tsp. of garlic salt. So simple and yet amazing. Buffalo Sauce. My husband mixes his with a little ranch and butter. It’s amazing for everything! Mustard. Okay, so some people love it and others not so much, but mustard will always have a place as a pizza dipping sauce. Honey mustard might taste pretty good too. Chili pepper. A sprinkle of red chili pepper flakes is a nice spicy touch for those that don’t mind the heat. Italian Seasoning. I always have this in my pantry for sprinkling on pizza. I love the herby taste it gives to any Italian dish. Just sprinkle lightly on your finished pizza roses. Make these cute pizza roses for a romantic dinner for two, Valentine’s day, Mother’s day, weddings or pretty much any special occasion. If you LOVE this recipe for pizza roses recipe please give us a 5 star review below! Preheat oven to 350 degrees F. Take the pie crust dough strips and lay one out at a time. Brush on a layer of the Bertolli® Pasta Sauce onto one side of the pie crust. Add a layer of the shredded cheese. On top of that add a layer of the sliced tomatoes and sprinkle with basil. Place the tomatoes near the top of the crust and then roll the whole thing from edge to edge. From here fan out the tops a little to resemble roses. Place each roll into a muffin pan cavity. Each pie crust will make around 6 roses. Bake at 350 F for 30 to 35 minutes or until the pie crust is turning a golden brown. Take each rose out carefully. You may need to go around the edges once with a knife before taking out depending on how much cheese oozes during baking. Enjoy! So making these and gonna watch them disappear!